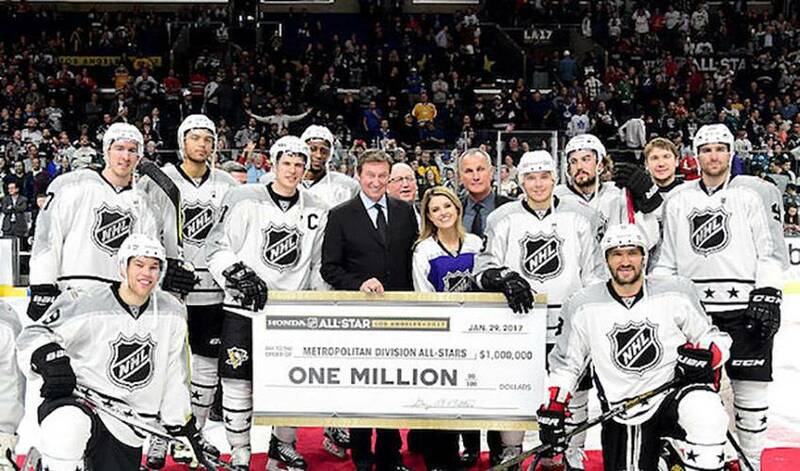 The curtains have closed on the 2017 NHL All-Star Game, and the event was full of all the pageantry and plot twists you'd expect from any Hollywood affair. The game-winning, million dollar goal fittingly came off the stick of Wayne Simmonds, whose NHL career began in Los Angeles, for a 4-3 Metropolitan Division victory over the Pacific. Simmonds was named the Tournament MVP, and also notched a pair of unassisted goals in a 10-6 win over the Atlantic. The weekend's festivities kicked off Friday as the NHL continued their celebration of the 100 greatest NHL players by announcing the remaining 67 legends named to the NHL 100, joining the previously announced group of 33. The list included six current players, including Jaromir Jagr, Sidney Crosby, Alex Ovechkin, Patrick Kane, Jonathan Toews, and Duncan Keith. In a room brimming full of NHL hockey legends being honoured, the moment was not lost on anyone. Rapper and DJ Snoop Dogg was on hand to perform during the Skills Competition. The legendary performer has a known history of passion for the game of hockey, and you can catch him in any number of jerseys depending on where he’s performing, though the rapper professes allegiance to the Anaheim Ducks. In fact, the Doggfather got some lessons from former Ducks captain Chris Pronger back in 2008. Justin Bieber also took a lesson on the fly from Pronger, which came along the boards of the All-Star weekend during the singer’s participation in the Celebrity Shootout game. All kidding aside, the skill level showcased over the course of All-Star Weekend is impossible to deny, and easy to get caught up in. The Fastest Skater competition got particularly heated after Connor McDavid made known speedster Nathan MacKinnon look slow, and went on to try and beat Larkin’s record of 13.172 seconds. McDavid narrowly missed the mark, and while social media was quick to put an asterisk next to Larkin’s record, Larkin didn't hesitate to show what a good sport he is – while giving fans a head-to-head to look forward to. (CONT) get a start like I did for the sake of all organized skating events in the future! @cmcdavid97 was buzzing! Head to head one day? Shea Weber, unsurprisingly, took home the Hardest Shot title for the third consecutive year – but the first time he did so while representing the Atlantic Division. He hit 102.8 mph to beat out rookie Patrik Laine’s 101.7 mph. The weekend’s festivities gave Brent Burns’ son a chance to catch up with his favourite player – Johnny Gaudreau. Ryan Kesler, booed heavily in LA King territory as an Anaheim Duck, used an ingenious solution to help his Pacific Division to beat Carey Price. The score. The flop. The one-knee celly. It appears to have come full circle for Wayne Simmonds this weekend. Now six seasons removed from his time with the LA Kings, Simmonds leads his current Philadelphia Flyers in goals, with 21 on the season – good for 12th overall in the league. Simmonds is also having a great year off the ice, and got engaged just one week ago. He’s earned the ‘A’ on his chest for his constant contributions off the ice, while also earning the moniker “Wayne Train”. Simmonds also has a track record for his off-ice accomplishments. The winger founded Wayne’s Road Hockey Warriors (WRHW) - an annual charity ball hockey tournament that gives back to the community he grew up playing hockey in. Visit waynesimmonds17.com for more information on the tournament. And for more 2017 NHL All-Star Weekend highlights, follow the #NHLAllStar hashtag.